lead guitar on it it just seemed to sing. that could only have come from France. What stories they could tell! thought about writing this music. I love this album - it just makes me feel good! Had heard Gerry's music on the radio and fell in love with the sound. I would highly recommend "Bog Bodies" for a moment of calm in this crazy world ! Thanks Gerry ! Hey Gerry, we've met a few times, you wouldn't remember, doesn't matter... This CD is so cool!!! I just wanted you to know...I appreciate it, really good, creative, lush, soulful guitar. It's a journey every time ! Yay Obama !!! I've been a fan of Gerry's since I saw him perform a few years ago (with Rosie Shipley), and have been anticipating a new album. This is music at it's finest. I love it !! Beautifully played album of guitar music. This is an album of beautiful acoustic guitar music and original composition. Though initially disappointing due to the lack of songs (present with my other album & live performances), it holds up very well and I love it. 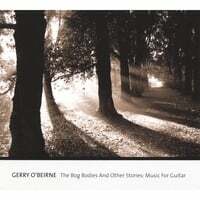 It's been a long time since Gerry's stunning first album, Half Moon Bay, but this one is well worth the wait. I'm seldom a fan of instrumental-only music, but the intricacy of these compositions makes vocals superfluous. Congratulations, Gerry-- another absolutely beautiful recording! I've been a fan since just after my daughter learned to walk. The guitar work was spell-binding, and I listen and relax as if I were on the beach in some secluded place. Not quite bog, but it's where I relax. The only thing I missed was the singing. Your images and the depth that flows through them as you play have always taken me to special places. Anyone who has seen Gerry O'Beirne perform knows that moment when he stomps his foot, closes his eyes and loses himself in the music. This album invites the listener to join him in that place where the backbeat is quietly driving, and the tunes are alternately eerie, melodic, powerful, sweet... My favorite is "Winter Sun" -- there is no other guitar sound in the world like Gerry's 12-string. This album is long-awaited and highly treasured. Another great album from a great gitarplayer!